Jetcraft, a leading international business aircraft broker, in an effort to further elevate its brand as an industry leader ahead of market developments, launched its own annual market forecast report that presents the state of the business aviation industry in a more agnostic/objective way than others currently analyzing the sector. The report, for example, did not favor any aircraft or other OEM, such as Honeywell’s annual market report does. 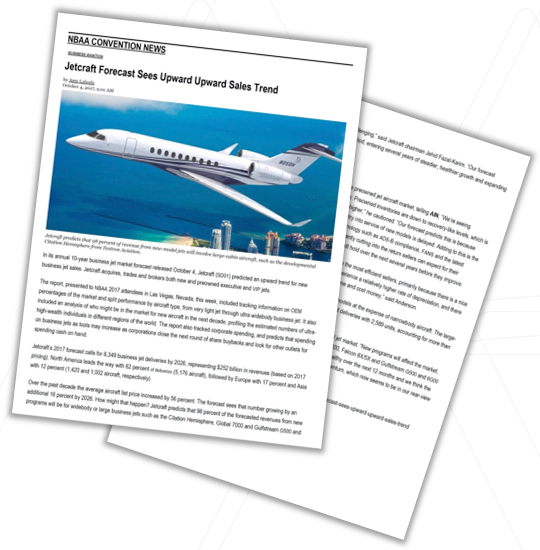 A longtime client, Mach Media worked with Jetcraft to execute a media relations and report launch campaign that would garner coverage for its market forecast ahead of its competition releasing theirs. 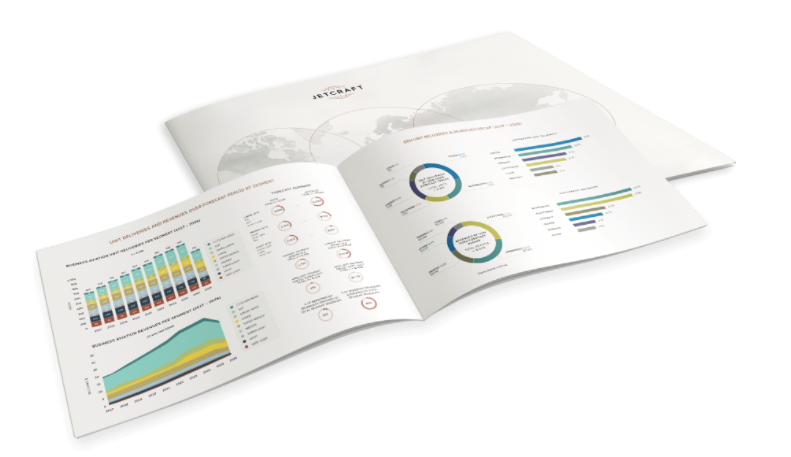 Once the report was finalized by Jetcraft, Mach Media analyzed the findings and crafted the key takeaways of the 10-year report, which highlights fleet forecasts and financing trends, including unique results not tracked by other forecasts. Mach Media then launched a media relations campaign that included business and trade press outreach, along with a social media campaign to amplify the message across multiple channels. Mach Media also crafted key messaging documents, FAQs, blog posts, email marketing and website copy that maintained message continuity. For the media relations campaign, Mach Media drafted the news release, and crafted a publicity schedule that took into account on-record exclusives and advances. Using a cultivated media list for the business aviation sector, Mach Media drafted customized media pitches with unique angles for each publication. Mach Media distributed the pitches and executed follow-up calls with journalists, ultimately securing exclusive interviews with top-tier business publications, advances with the top three aviation industry publications and on-record interviews with leading trade publications. Once interviews were scheduled, Mach Media developed media briefings for Jetcraft C-level executives that focused on the key messaging pertinent to each media outlet. Finally, to ensure Jetcraft would seamlessly deliver, Mach Media conducted a concise consultation with each spokesperson. For the social media campaign, Mach Media developed and planned social media posts for LinkedIn, Facebook and Twitter in advance of the report’s launch to peak people’s interest; on the day of the launch to make the big announcement; and after the launch to continue engagement and increasing website traffic and downloads of the report. 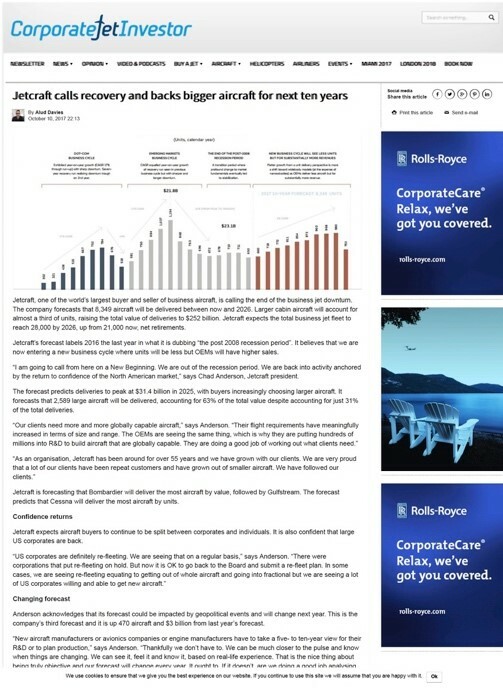 The media relations campaign garnered significant coverage in The New York Times, Reuters, Flight Global, Business & Commercial Aviation, Aviation International News, AviationWeek and numerous other trade publications. In all, Jetcraft had 12 interviews and gained top coverage in the show dailies – a prerequisite by the client – during one of the industry’s largest events: NBAA’s Business Aviation Convention & Exhibition. In subsequent years, Mach Media updated its media relations strategy to garner Day 1 coverage in the show dailies, as well as increase the overall business press coverage while maintaining media interest on the report throughout the year.